The cast of "A Midsummer NIght's Dream" at Pittsfield's Shakespeare in the Park. According to the Berkshire Visitors Bureau, tourists spend $355 million a year in Berkshire County, leading to an economic impact of $564 million a year. Aside from the area’s natural beauty, much of that credit goes to the region’s arts and performance venues. A mainstay wrapping up its 82nd season this weekend is Jacob’s Pillow Dance Festival. On average, the center in Becket hosts some 90,000 visitors from June to August. Executive and artistic director Ella Baff says this season was perhaps the best in the past 10 years as performances broke box-office records. Baff says the numbers exceeded expectations. Baff adds visitors are also spending more time at the center viewing galleries and video archives. The returning customer also helped the Williamstown Theatre Festival sell 35,000 tickets over seven weeks this season; the highest in four years despite having one fewer production. Steve Kaus is the Festival’s producer. Kaus credits the success to outgoing artistic director Jenny Gersten, who crafted the lineup with a range of genres. He adds the strong turnout numbers weren’t limited to Williamstown Theatre Festival, celebrating its 60th season. “The amount of people who would come and in and say ‘I couldn’t find parking in this town and I couldn’t get a dinner reservation in this town because The Clark is full, you’re full, WCMA’s [Williams College Museum of Art] full and [MASS] MoCA’s full’…that’s a good problem to have,” said Kaus. Baff is hopeful that when one area venue succeeds, others do as well. 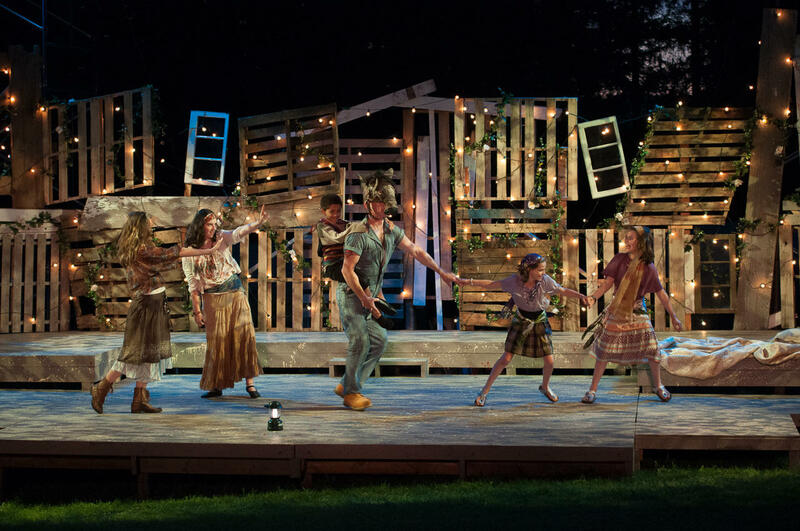 Aside from those with long-standing traditions, a newcomer built its way to this summer’s stage…literally. With the community chipping in costumes, props and building materials, Enrico Spada founded and launched Pittsfield’s Shakespeare in the Park. He says eight July performances of A Midsummer Night’s Dream on a temporary stage at Springside Park drew 1,500 people. “Which is more than I ever could expect and just a real thrill to see that people looking to see free, outdoor Shakespeare,” said Spada. With cameo appearances by Mayor Dan Bianchi and others, Spada adds the youngest audience members were captivated by the performances…most of the time. “But every once in a while, you’ll see them kind of go off the wire a little bit and running around just enjoying being outside in the park while mom and dad continue to watch the show,” Spada said with a laugh. Overall the group raised $30,000, enough to cover expenses. Next summer, Spada hopes to raise enough to pay the 19 actors. He also anticipates a move to Pittsfield’s First Street Common, which is undergoing a facelift, and expanding the program’s outreach into area schools. Half a dozen friends who met at Carnegie Mellon School of Drama in 2008 decided to put on a show. No, this is not a joke. The next thing you know, they form a theater company - a grassroots, low finance, but high-tech troupe that stages original stories based on traditional forms like fables and myths, using time-tested theatrical devices including shadow screens, puppetry, flashlights, and original live music performed by the actors. The Jacob’s Pillow Dance Festival has announced its 2014 season lineup. The 82nd season of the nation’s longest-running dance festival will showcase 350 performances from June to August. With 52 companies performing on three stages, visitors will be treated to a mix of classic ballet and more modern dance. Young ballet dancers from the region had a chance to learn from world-renowned performers in western Massachusetts this week. The final show on The Nikos Stage at the Williamstown Theatre Festival this summer is a magical lo-fi musical storytelling feat created and co-directed by PigPen Theatre Co. - The Old Man and the Old Moon runs from August 6th to August 17th. PigPen Theatre Co. began creating their unique brand of music, film, and theatre as freshman at the Carnegie Mellon School of Drama in 2008. They have produced their original plays Off-Broadway and at regional theaters around the country.